August 30, 2018, 11:16 PM · We shared earlier the big dining news from Disney today, that the bar in the two new Star Wars lands coming to Disneyland and Walt Disney World will be called Oga's Cantina and they will serve alcohol, ending Disneyland's long-standing policy against that. But we have more food news from the Disney parks today, too. 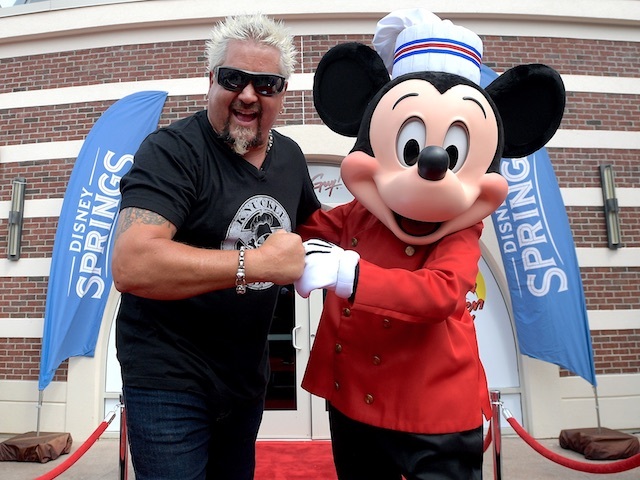 Across the country at Walt Disney World, Chicken Guy held its official opening ceremony at Disney Springs, with chef Guy Fieri joining Chef Mickey to cut the ribbon. Chicken Guy is Fieri's latest fast-casual concept, serving chicken tenders with a variety of sauces — on sandwiches, on skewers, or on salads — along with a couple of Flavortown Frozen Treats desserts. You will find it next to the movie theaters. Finally, Disney announced today that it will offer another character dining meal at Walt Disney World, this time at Artist Point in the Wilderness Lodge. "Storybook Dining at Artist Point" will begin this winter and follow a Snow White and the Seven Dwarfs theme. The prix fixe menu will feature shared starters, a choice of individual plated entrees and 'sweet spells' as dessert. Snow White, Dopey, and Grumpy will greet diners, and there will be music and other activities, including an encounter with The Queen. (Yikes!) No word yet on prices or a start date, though Artist Point is taking dinner reservations only through November 10, so look for the character dining to begin at some point after that. The dining experiences at DSTP just keep getting more and more amazing! A celebrity chef-ified (and undoubtedly overpriced) version of Raising Cain's. Just what Disney Springs needed. Hopefully this will give imagineers the boost they need to add a "Flavortown" themed overlay for Dinoland! They can use an old Dreamfinder animatronic to create a Guy Fieri one! Terribly sad about the Artist Point change. This was truly a beautiful restaurant with fine dining. Guy Fieri is the lowest common denominator for celebrity chefs. Anyone considering his addition to anything a success does not know good food.